"Chef Frank takes the lid off his poaching pot supplying the know-how for novice and experienced cooks who want to cook better - with local. Garlic scapes are treated like asparagus." Try and get some small fillets (6-8 oz) these make a nice individual portion, and would allow you to serve the fish with out having to cut it. I also find that these have a more delicate texture when cooked than the larger fillets (12-16 oz). 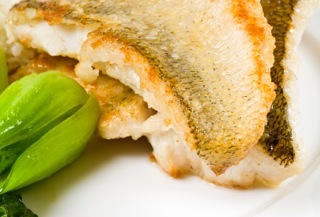 Braising is a technique that uses a combination of heat and liquid to cook a particular food product; in this case Pickerel. 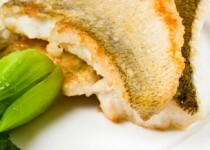 Pickerel has a very mild, subtle texture and flavour, one of the best ways to accentuate this, is by braising this fish. To make the braising liquid is very simple, not to worry, you do not need fish stock on hand to make this. In a pan, combine 1 part butter and 3 parts water (should you be lactose intolerant, use a neutral tasting coconut oil ( which at room temperature has a similar consistency as butter). Yes the flavour profile changes slightly, but trust me it works. Add a sprinkle of sea salt, the juice from 1/4-1/2 a lemon and let simmer for approx 3 minutes. The fish does not need to be completely submerged, as you will want to flip the fish part way through the cooking process. To prepare the fish fillet, place on clean work surface or plate. Lightly season with sea salt, a squeeze of lemon juice, then let rest in refrigerator for approx. 30 min. This allows the salt and lemon to infuse the fillet, remember acid always helps to accentuate and bolster a specific flavour. So your fish is ready to go. Before you did all this you would have prepared your salsa, which you have allowed to rest for approx. 2 hrs, prior to plating. Before you start cutting anything, place a pot of salted water on your stove and turn on, at this time you should also prep a water/ice bath (you will need this to cool down your blanched vegetables). The water can be heating up while you are cutting all your vegetables. This way when you are done with cutting your garlic scapes and asparagus, you can blanched them immediately. A side note to blanching; make sure you have enough water relative to the amount of vegetables you are blanching. The more water you have, the less your water temperature will drop, thus reducing your blanching time, and ultimately not breaking down those little enzymes that keep that beautiful green colour of these vegetables intact. Plunging the blanched vegetables in the water bath stops the cooking process and once again aids in keeping those vegetables colours vibrant. 5 parts water to 1 part vegetable. Remember, this blanching water can be reused again, simply refrigerate for up to 10 days. You have just created your own vegetable stock, it's that simple. Now, cut and chop your vegetables as mentioned in the ingredient list, and keep all ingredients separate except the peppers (they can be combined in the same bowl). Blanched Asparagus for 2 min. and Scapes for 304 (they should still have a little bite to them, so check on them while blanching). Saute your onions with a little bit of grape seed oil , just until they are translucent, they should not have any colour, and let cool. Combine Scapes, Asparagus, diced peppers, diced tomatoes, onions, cilantro, add only enough of the vinaigrette to"infuse". Remember that the ground black pepper is there to give just a hint of spice, do not add too much as it will take over the whole dish (remember you can always add more, but it is very hard to remove). Just before service, taste the salsa and add vinaigrette or seasoning at your discretion. Heat your "broth" in a pan, it should never come to a boil!! Add your fish skin side down, and let "steep" in broth for 2 minutes, turn fish and let sit for same amount of time. Then turn off heat, cover with a lid and let sit fore 5-8 minutes. Allowing the fish to rest and relax in the broth before service. Serve on a plate or bowl. Place fish skin side up (this skin is very thin and tender, so it is fine to eat), and then drizzle the salsa over the fish. This make a nice light meal as is, and would certainly qualify as a paleo dish. It could also be served with roasted mini potatoes, sweet potato mash, waffle potatoes, just some ideas. Should you be inclined to have some wine with this dish, try the 2013 unoaked chardonnay from Kacaba Vineyards, which is located on the Niagara Peninsula Appellation.